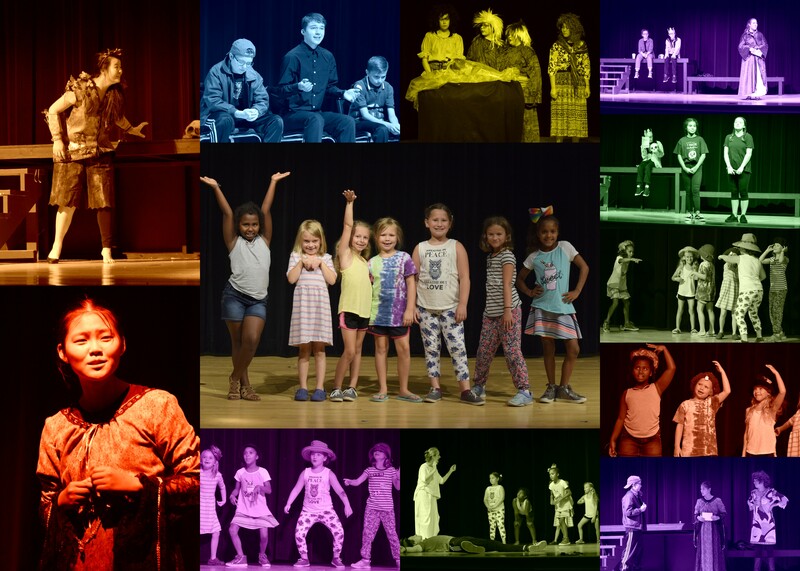 For the 2nd year, RiverStage Community Theatre is pleased to announce “RiverStage Summer Theatre Academy,” offering four theatre camp experiences for kids from grades 2-11! Students entering 2nd and 3rd grades will get on their feet and get active in this fun introduction to the games that actors and actresses play! Using a wide range of techniques to exercise the mind, body and voice, your kids will have a blast making friends, getting comfortable on the stage, getting their creative juices flowing, and learning how professional actors work together to begin creating great characters, scenes and stories! Family and friends will be invited to a sharing demonstration of our skills during the last hour of the final session. Learn how to use your body and the stage to maximize your performance! This camp will help you learn how to move dynamically with movement classes to help you become body and audience aware. It will help you become comfortable in your own skin onstage to let you bring your character to life so that the audience feels the character is real and become invested in the story. You’ll become comfortable onstage, hit your marks with confidence, and improve your timing & quality of movement. Topics of the day to include: an introduction to the world of theatre, different types of stages and who uses them, stage orientation, stage directions, who’s in charge backstage, backstage etiquette, hitting your mark, body awareness and audience impact. Family and friends will be invited to a sharing demonstration of our skills during the last hour of the final session. Many actors use ballet/dance to help communicate with the audience without using words. The pantomime camp has less to do with “speaking roles” it has to do more with stage presence, internalizing a character, subtle body movements and clear gestures needed to fully commit to a character when “speaking” onstage. Each day will include creative movement, student-led storytelling with pantomime choreography, and topics of the day to include: stage orientation, character types, using props properly, acting exercises and games, and pantomime exercises and games. Family and friends will be invited to a sharing demonstration of our skills during the last hour of the final session. “Welcome to EXPOSED! the show that reveals the truth behind famous fictional characters!” And so begins this funny, fast-paced comedy presented in eight “acts” that tells modern-day versions of classic stories with a twist. Was Robin Hood really responsible for all that thieving, or was it his sister? Who did Dr. Jekyll really turn into? Was Charles Dickens actually a frustrated stand-up comic? And who was really in charge at the Wonka Chocolate Factory? Students in this two-week camp will expand their comedic and dramatic skills as they learn more about blocking, physicality, creating character, and the love of telling a story to the audience. As they rehearse the large ensemble comedy Exposed! by Sean Abley, designed for a camp just like this with many roles spread out over eight intensive scenes, students will sharpen their technique and explore what they can bring to the stage, their power as a performer, and their passion for theatre. Plus, a lineup of RiverStage guest artists will visit for special sessions on costuming, props, stage management and more. A great opportunity for young actors and actresses! Two performances will be open to the public on Friday July 26th at 7:30pm and Saturday, July 27th at 2:30pm. • All camps are located at the Greenspace Center Auditorium (a.k.a. Old Lewisburg High School), 815 Market St, Lewisburg, PA 17837. • Students must be entering the indicated grade level in Fall 2019 to participate in a camp. • Each session will include a snack break. Students in grades 6-11 who register for both “Stagecraft & Movement” and “Exposed,” or students in grades 2-5 who register for both “Let’s Play” and the Lewisburg Children’s Museum 4-H camp will also be asked to pack a bag lunch and have lunch-hour during the 12-1pm break between camps. • Camps are held Monday thru Friday, with some camps giving final performances on Friday or Saturday(see descriptions for details). • Siblings/family members receive a discount when you enroll in the same camp! Each additional family member in a one-week camp receives $10 off, and each additional family member in a two-week camp receives $20 off. • Students in grades 6-11 who enroll in both the “Stagecraft & Movement” and “Exposed! Comedy” camps during the week of July 15-19 receive $10 off their total registration, plus an extra hour over lunch. • Partial scholarships may be available on an as-needed basis. For financial aid information, please email Maggie Able at mable@riverstagetheatre.org.